One of the first things you’ll discover when traveling to Costa Rica is just how many spectacular waterfalls there are to explore. As someone who previously was not a huge “waterfall person,” Costa Rica has officially done it and turned me into a waterfall aficionado. Each waterfall in Costa Rica is different and unique. Many are remote, surrounded by pristine jungle and only accessible via a long hike. Some have crystal-clear pools that are perfect for cooling off on a hot, tropical day. And others are easily accessible for all ages and fitness levels. We’re lucky to have quite a few beautiful waterfalls in Uvita. And what better way to start any day than with a hike to a secluded waterfall AND a leisurely swim? Sounds like the perfect morning to us. We’ve named this waterfall ourselves as we’re pretty sure it doesn’t have an official name! You’ll find “The Bamboo Waterfall” a few kilometers past Uvita’s stunning Bamboo Forest. You can opt to drive all the way to the waterfall, but we much prefer to hike. After all, swimming in the freezing natural pool is much more enjoyable when you’re already sweating buckets! To arrive at this waterfall, you’ll first cross a small footbridge that will lead you to the start of the Bamboo Forest. Here you can enjoy about a kilometer of towering bamboo (keeping you somewhat sheltered from the sun.) When the road splits, keep to the left up a steep hill for another couple of kilometers. It’s an uphill climb, but the jungle and valley views are well worth the effort. Finally, you’ll run straight into the small but lovely waterfall! Go for a dip or climb the stone levels for some wonderful photo ops. If you go on a weekday, you’ll likely have the place to yourself. If it’s a weekend, expect to share the spot with other local families going for a swim and a picnic! 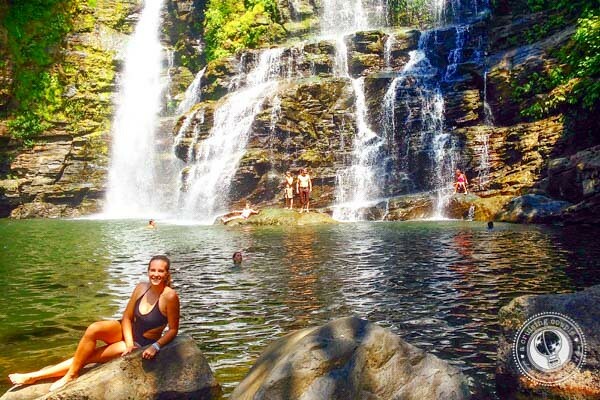 The Uvita Waterfall is perhaps the town’s biggest attraction—and rightfully so! Here, not only will you find a beautiful waterfall, but you’ll also have a one-of-a-kind natural water slide! If you’re adventurous, you can climb to the top of the waterfall and then slide straight into the chilling pool below. Apart from the main pool beneath the natural water slide, there are some other swimming holes downstream that you’ll easily see while walking down the stairs. After you enjoy swimming and sliding in the waterfall, stop by the restaurant for a smoothie or, our drink of choice, a michelada! 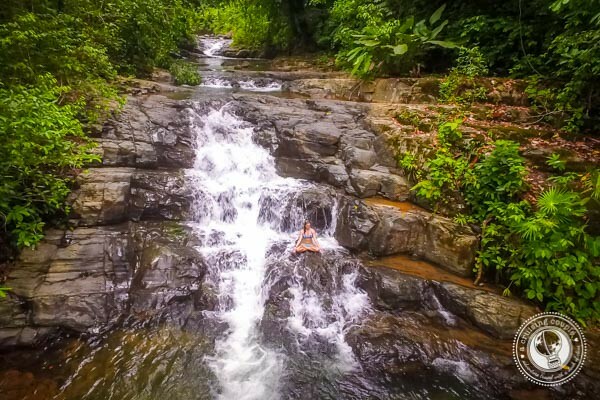 To learn more about the Uvita Waterfall, be sure to read the full article: The Uvita Waterfall: A Thrilling Natural Waterslide. Technically this waterfall is in Ojochal, but it’s just a short drive from Uvita, and definitely a spot that’s well worth checking out if you’re in the area! What’s unique about this waterfall is the large rock that’s seemingly wedged in the middle of the rocks at the top of the falls. It makes a beautiful backdrop for a quick swim. You can also opt to walk to the top of the rock for a great view of the surrounding area. Finally, head downstream to enjoy the scenic river surrounded by lush rainforest. 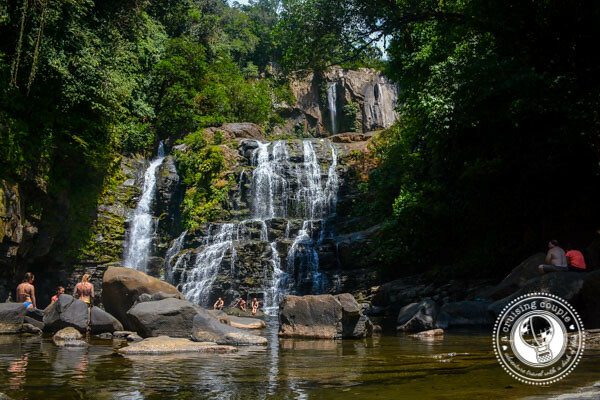 El Pavon is one of the easiest waterfalls in the area to arrive at, with limited hiking required. You’ll find it down a short path just 100 meters off the road. If you want the true Tico (local) experience, combine your visit to El Pavon with a stop at the nearby tilapia farm, Bar y Restaurant Tilapia El Pavon. These tilapia restaurants are common throughout Costa Rica, and a great inexpensive way to enjoy fresh fish. First, you’ll get some fishing wire to go out to the pond and catch your own tilapia. Then the restaurant will fry up your fresh catch and serve it with rice, beans, salad and other typical sides. To arrive at El Pavon, you’ll drive south of Ojochal for five to ten minutes. Then, look for the signs to Bar and Restaurant Tilapia El Pavon. The waterfall is right nearby! 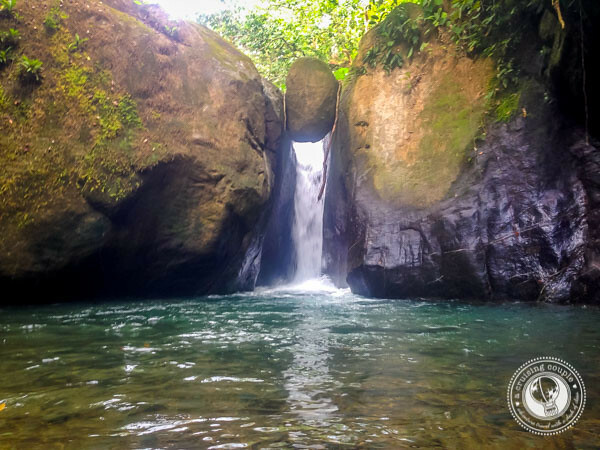 This is another waterfall that technically isn’t in Uvita, but is close by enough that you definitely won’t want to miss visiting if you’re anywhere in the area! In fact, Nauyaca Falls is easily our favorite waterfall in all of Costa Rica. Located 15 minutes up the steep mountain road from Dominical (Route 243), the stunning Nauyaca Falls come in at over 200 feet tall. 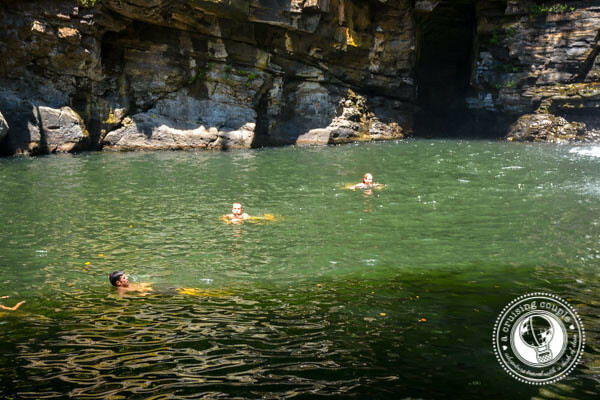 At the bottom of the falls is, you guessed it, a large natural swimming hole. If you’re looking for the most dramatic falls in the area, Nauyaca is the easy choice. Learn all the details about this waterfall in our full article: Your Ultimate Guide To Visiting Nauyaca Falls, Costa Rica. 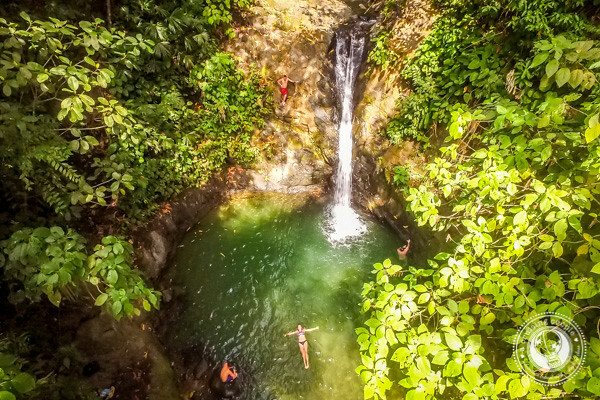 There are countless more waterfalls tucked away in the Uvita area that we don’t even know about, but these are four of our favorites that are easy day trips and magical must-visits on any trip to Southern Costa Rica. Which waterfall here looks the most interesting to you? 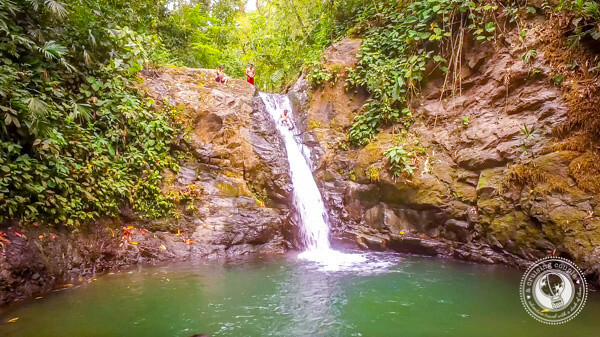 Have you visited any of these waterfalls in Uvita?